The house was built in a combination of the Romanesque Revival/Second Empire Mansard style of France. The single fronted three-story style has a mansard roof with protruding third floor windows. Prominent bay windows grace the front rooms on the first and second floor. 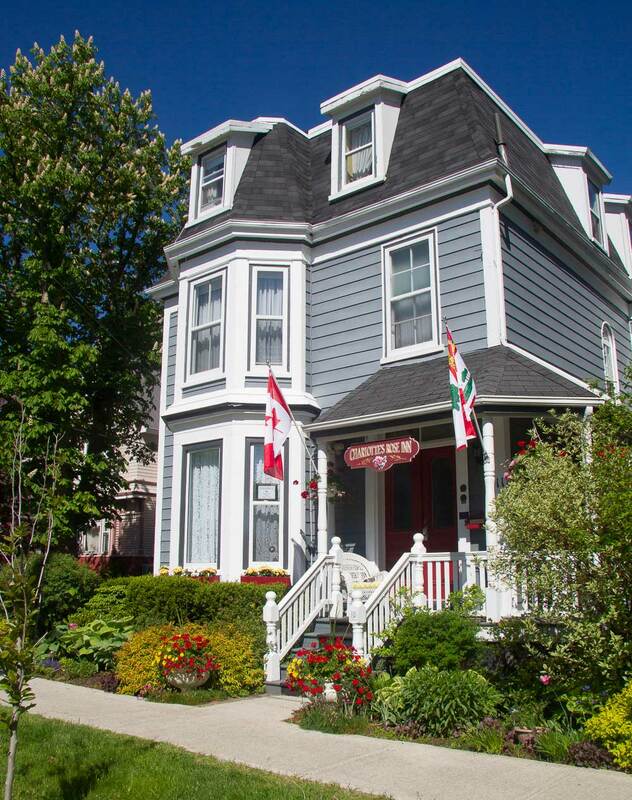 Our 1884 Victorian Inn features period architectural detailing with all of the modern amenities to make your stay perfect. The Inn and its rooms are tastefully decorated, with lovely common areas for relaxing. The Charlotte's Rose Inn in downtown Charlottetown. Entryway featuring period wallpaper and our lovely stairway. The Lounge, the perfect place for relaxing and visiting. Gusts of the Inn have access to a guest computer in the lounge. Fresh tea & coffee provided in the lounge throughout the day. Breakfast is served here each morning between 7:30am and 9:00am. Get a delicious start to your day with your complimentary breakfast. Confederation suite, with a queen-size four-poster bed. Confederation ensuite with Jacuzzi tub. Montgomery suite, with twin beds that can be converted to one king. Montgomery ensuite, with large vanity, tub and overhead shower. Jaques Cartier suite, with queen size bed. Jaques Cartier ensuite with Victorian-style claw-foot bathtub. MacDonald suite, with a queen size bed.